Pain. Doubt. Frustration. Questions. Trust. Hope. These are the emotions of over a third of the Psalms. They are called laments – the historic prayer language of God’s people for processing pain. Psalms of Lament were written by hurting people for hurting people. Turn to Prayer – Refusing to allow pain to push you into despair, denial, or silence. Lament prayers are protests against pain as you turn to God for help. Bring Your Complaint – Telling God about your struggles, your questions, your frustrations, and why you are hurting. Remember, he’ll not be surprised. Ask Boldly – Calling upon God to act in accordance with his character and power. Choose to Trust – This is where lament is designed to lead. It invites you to place your hope and confidence in a God who cares and who can be trusted – even when life is hard. 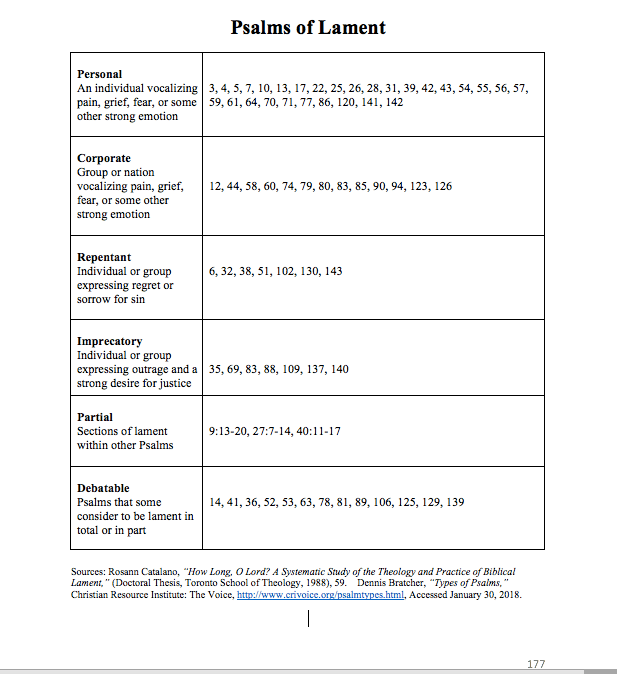 With this framework, you can explore the forty-plus Psalms of Lament. In my up-coming book, Dark Clouds, Deep Mercy: Discovering the Grace of Lament (released: March 2019), I include a chart with various categories of lament psalms. The variety reflects the wide array of life’s pain. It is good to know the Bible speaks the raw language of our human experience. Psalms of Lament are a gift. Take some time to read them.